Atlanta Business Chronicle has named our finalists for the 2018 Small Business Person of the Year Awards. The winners are scheduled to be announced at an awards event Sept. 20 at the Atlanta Botanical Garden. 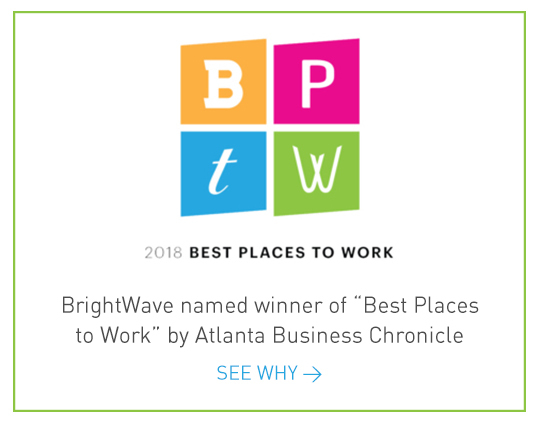 Here’s a Q&A with one of the finalists, Simms Jenkins, founder and CEO, Brightwave. Q: What strategies can small business owners use to build success into their companies from the start? A: Aggressively become a thought leader and industry disrupter. Writing content, speaking at conferences and being positioned as a subject matter expert will pay off in the short and long term. Leveraging your offline and online presence and networks are the sweet spot and it is no longer a luxury or secondary soft skill as today’s leaders need to build personal brands that drive business and real results. Hiring hungry people that can fit the tough early stages of a business are essential as well. But be ready to part ways as your company grows as it is rare for early-stage employees to make the jump to the next phase of the company. Q: What was the best piece of advice you took when starting your business? What advice did you disregard, if any? A: I had nothing to lose when I started my business so the advice of “it is better to start at the bottom than the top” slowly resonated. Some founders focus on home runs or raising money before building the business and that can be distracting and not essential when singles and foundational work are essential. When you start from scratch and stay scrappy, it keeps you humble and the possibilities are endless which is what most entrepreneurs truly enjoy. I have disregarded “hire slowly, fire fast” a few times and it has always proven to be a mistake. Q: What would you share with an aspiring entrepreneur who is considering taking the plunge and starting their own business? A: Three things: Make sure you have an initial game plan and get ready to divert from it. Ensure you have tested the idea/service/product with potential customers to gain invaluable feedback before you officially launch. Savor the good moments as it is a roller coaster. Q: How does metro Atlanta support the formation of small businesses? A: Atlanta is incredible and unique in my opinion in how it supports all types of businesses. The peer support and networking, even for competitive companies, is really special. It is a very friendly town and one that can root for the small business while cheering on its corporate titans. There are wonderful groups and events ready to support entrepreneurs and this is a city where experienced people will almost always say yes to a coffee or breakfast invite. Q: What can the region do better to help support small businesses?